Romesh Dhamija Productions, Mumbai is a team that comprises experienced wedding photographers in Mumbai. 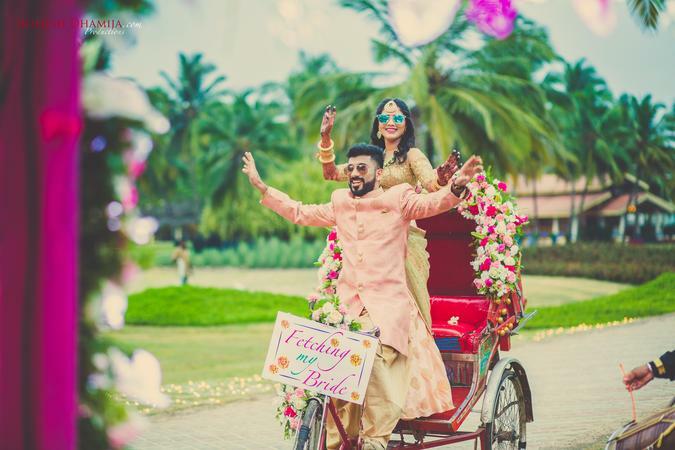 Offering an assortment of photography and other related services, Romesh Dhamija Productions strives to capture the moments of your wedding wrapped in its true colours. They excel in pre-wedding photoshoots, candid photography as well as traditional photography. They don’t just shoot weddings but capture your love story in our frames. Romesh Dhamija Productions is a Wedding Photographer based out of Goregaon East, Mumbai . Romesh Dhamija Productions's telephone number is 76-66-77-88-99, Romesh Dhamija Productions website address is http://www.romeshdhamija.com/, Facebook page is Romesh Dhamija Productions and address is 538, 5th floor, MasterMind 1, Royal Palms Estate, Goregaon East . In terms of pricing Romesh Dhamija Productions offers various packages starting at Rs 25000/-. Has been viewed 41 times and shortlisted by 1 customers over the last month. There are 2 albums here at Weddingz -- suggest you have a look. Call weddingz.in to book Romesh Dhamija Productions at guaranteed prices and with peace of mind.